There’s a word in Esan, a Nigerian dialect, that means “to finger-lick a bowl clean.” Doing this indicates one has experienced pure food enjoyment, says Edo Kitchen owner Easter Momodu, whose West African fare is so delicious, patrons might just want to eat with their hands—the norm in Nigeria—so they can lick their fingers clean. While Momodu can’t quite recall the word because he’s lived in America for more than 20 years now, his family recipes haven’t been lost. “I don’t even need to think when I cook, I just do it. It comes natural. 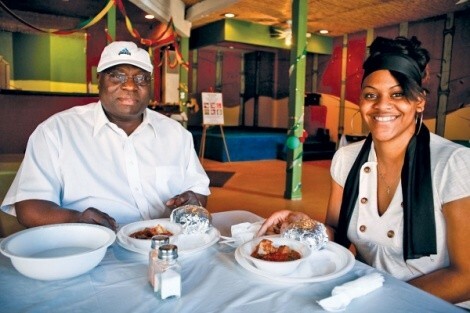 All the recipes are in my head,” says Momodu, pictured above with Edo employee Gloria Walton. “I learned from my old man, watching him cook." When Momodu emigrated from Nigeria to seek an education, he left behind a big family. However, they stay in touch—mainly through family members sending him “secret ingredients.” With a glowing smile, he opens a Priority Mail box and pulls out spices that meet his high standards—egusi (melon seed) and pepper soup seasoning, among others. “What makes my dishes flavorful are the secret ingredients from Africa,” he says. Edo Kitchen offers a limited but authentic menu that includes spicy, luscious peanut soup made from blended peanuts, tomatoes, onions, peppers and spinach. There’s also salty, extra-spicy goat pepper soup, fried plantains, joulof rice (fried rice with vegetables and shrimp), okra soup and egusi soup, both of the latter served with fufu (pounded yams). Edo’s white stuccoed storefront, which is at the building’s rear, combines with the four tables and brightly colored walls to conjure visions of a small-town Nigerian cafe. And evoking that feeling was intentional. “It’s like a gift to Americans—something from my native homeland. And I opened up, basically, for the love of cooking. I love to cook,” Momodu says.